The two essential ingredients to sparkling clean and enjoyable water are proper filtration and proper chemical treatment. Chemicals control or eliminate contaminants, like pollen, algae spores, perspiration, leaves, etc. When your water is too hard, your chemicals may not work as efficiently. This can cause corrosion, staining and scaling. Wondering about your water quality? At 365 Pool & Spa, you can bring a water sample in for a free computer analysis. San Antonio has seen a trend where local pool and spa operators are being bought up by chains who have replaced name brand chemicals with generic chemicals produced overseas to clear a larger profit. If they were chemically identical, this wouldn’t be a problem. Unfortunately, lower quality chemicals translates to lower quality water. That means you end up buying more to do less. 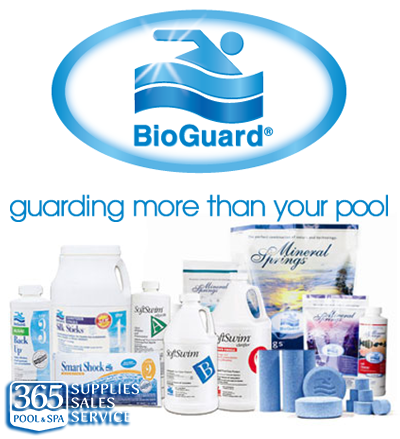 365 Pool & Spa is an authorized BioGuard dealer. What does this mean? BioGuard was one of the first companies to refine computerized pool water analysis and now has the most accurate water testing in the pool and spa industry. This helps 365 Pool & Spa personalize your pool and spa maintenance. Using BioGuard’s 3-step care system, you can keep your pool and spa water sparkling clear with a simple once-per-week program. Chlorine sensitive? Ask about effective chlorine alternatives. If you water is too hard, your chemicals may not work as efficiently. This can cause corrosion, staining and scaling. That’s why we invite you to bring in a sample of your pool and/or spa water for free analysis at 365 Pool & Spa. Identifies corrective procedures to handle excess total dissolved solids and excessive cyanuric acid stabilizer. Automatically computes the corrective amounts of chemicals for low alkalinity and adjusts for pH. Determines the quantity of acid required to lower total alkalinity and breaks it down into the proper sequence of daily applications. Computes the saturation index and balances calcium hardness. Prescribes the amount of Pool Magnet required for the presence of iron, copper, or manganese and the amount of Scale Inhibitor required. Evaluates stabilizer levels and recommends a prescribed amount if necessary. Determines initial and maintenance dosages of Algicide Inhibitor for the pool size. Evaluates water clarity, algaes and filtration. Remember, water is always evaporating from your pool or spa and new contaminants are always being added along with the water, including the calcium and minerals that make San Antonio water hard. Inb short, anything not filtered out is left behind. All this seems rather complicated, but the BioGuard system makes it simple. In very short order, we can help you get and keep that sparkling, comfortable water you look forward to enjoying year-round. We look forward to helping you enjoy the best possible outdoor living experience for you and your family. Drop by the store at 7015 Bandera Rd, fill out the contact form, or call us today at (210) 277-8281 for fast and friendly service!